Still Life with Judas & Lightning was a finalist for the 2015 Oregon Book Award in Poetry. Following a "caravan of mystery,” Dawn Diez Willis’s first collection enacts a multifaceted pilgrimage into the nature of the sacred. Ruminating on an everyday darkness, these poems lean toward the light within the fierce vitality of existence. With musical lusciousness and deeply felt images, Still Life with Judas & Lightning unfolds like a peony, the lives like petals forming a single experience of complex beauty. 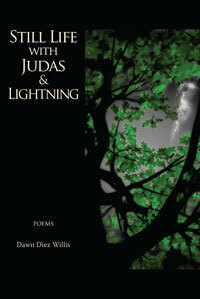 Dawn Diez Willis's Still Life with Judas & Lightning (Airlie Press) has garnered praise from poets such as Dorianne Laux, Gina Rae Foster, Major Jackson, and Garrett Hongo. "Dawn Diez Willis’s Still Life with Judas & Lightning is a quietly startling book and a strong debut. [...] In their vividness of scene, their stark presentations of characters stripped down to their souls, these poems put me in mind of Ai’s Cruelty, yet Willis’s book might better be called Mercy for the counterpoint of compassion that radiates in every line she writes." "You’ll find here the seething distance of an observer give way to cherished truths, more revealing than any confession. Here are the utterances that make the knowable an intimate encounter with the unknowable."